Each month we scour through millions of online recipes to find you quick and easy, braces friendly foods for the entire family. 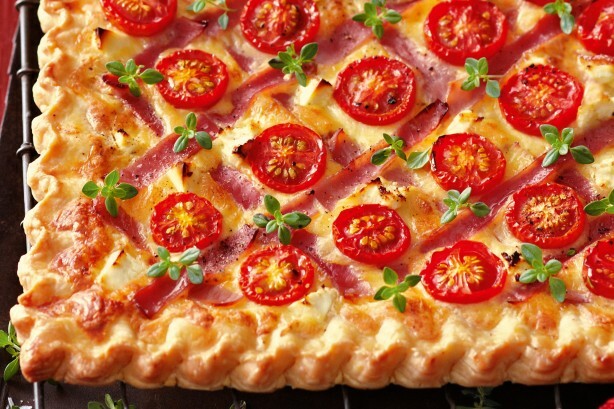 We found this delicious cheese, ham and tomato tart on Taste.com – it’s great for a light lunch or summer snack! Bon apetit! Preheat oven to 220°C. Line a baking tray with non-stick baking paper. Cut 1 pastry sheet into 8 strips. Place remaining pastry sheet on the tray. Place 2 pastry strips on top of each other along the edge of the pastry sheet to create a border. Repeat with remaining strips. Trim excess pastry at the corners. Pinch the edges of the pastry to decorate. Whisk the sour cream and 1 egg in a bowl until well combined. Season with salt and pepper. Stir in the cheddar and Swiss cheese. Spread the cheese mixture over the pastry, leaving a 2cm border around the edge. Arrange the ham in a diamond pattern over the cheese mixture. Place 1 tomato half, cut-side up, in the centre of each diamond. Top with the feta. Whisk the remaining egg in a small bowl. Brush the edges of the pastry with the egg. Bake for 20 minutes or until golden. Top with lemon thyme.